As part of the “Journey to Jesus” process at Epiclesis, we use the following Spiritual Gifts Inventory (Wagner-Modified Houts Questionnaire). 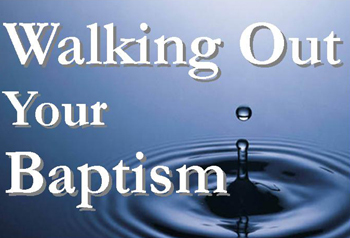 The four-part study that we use as a preparation for baptism in our community of faith, called “Walking Out Your Baptism”, is available here in a .pdf format. One helpful note: The .pdf document is a facsimile of a print-ready booklet. Once you open, or download it, you’ll need to scroll through the pages, or print and assemble it, in order to see the pages in proper order. This publication is copyrighted by Pastor Chris Alford and you’re very welcome to use it. He requests that you ask for permission and that you properly attribute the work. Find a collection of short articles on a wide variety of topics on this page. What Makes Us Ancient-Future. It’s an important question, especially since our community of faith has set out on a path marked by that description. So, what does it mean? Is it a worship style, or maybe a church growth technique? Why Worship is the Purpose of the Church. Subtitled “Theological Reflections on ‘Purpose’ and ‘Task'” this article by Pastor Chris lays out some of the foundational theology of the Epiclesis community of faith. Worship in Our Community of Faith. Check out this booklet that helps describe worship in our community. From worship symbols to the Christian Year, you’ll find lots of helpful information here.